12th Planet and his SMOG Records crew are gearing up to bring their fresh blend of genre-bending bass music to several Midwest cities next month. 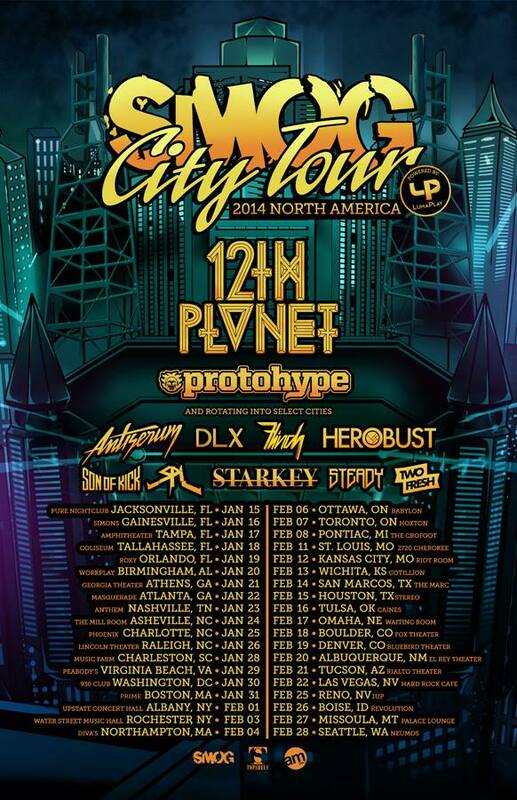 Part of the aggressive 38-date “SMOG City Tour,” 12th Planet will be accompanied by a handful of emerging bass music artists on select dates, including Antiserum, DLX, Flinch, HeRobust, Protohype, Son of Kick, SPL, Starkey, Steady, and Two Fresh. SMOG was founded by 12th Planet himself and originally served as an event production company in Los Angeles focused on the dubstep and bass music movement. SMOG has since evolved into a record label, artist development hub, and lifestyle brand. Feb. 8 – Detroit (Pontiac), Mich.
Feb. 11 – St. Louis, Mo. Feb. 12 – Kansas City, Mo. Feb. 13 – Wichita, Kan.
Feb. 14 – San Marcos, Tex. Feb. 15 – Houston, Tex. Feb. 16 – Tulsa, Okla.
Feb. 17 – Omaha, Neb. Feb. 18 – Boulder, Colo.
Feb. 19 – Denver, Colo.